Master Pyroserve Sdn Bhd (MPS) operates the Fire Department’s privatized Computerized Fire Alarm Monitoring System (CMS). With a growing subscriber base, it is the clear market leader in this segment. 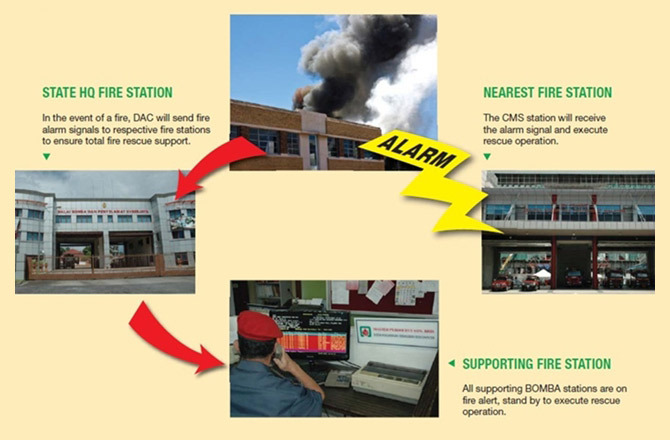 68 CMS stations have been commissioned in various Fire Departments throughout Malaysia. Supported by authorised distributors and branches nationwide, MPS persistently strives to provide a high level of service to all its clients using the latest, advance improvised control panel, programming & troubleshooting tools. A proven & established track record in maintaining its accreditation of the prestigious ISO 9002/ 9001:2000 since 1996, it serves as another benchmark of our successful achievement & recognition in ensuring service excellence to all our clients. The Fire Maintenance Services business unit has over 30 years of experience in installation, corrective and preventive maintenance within the fire industry. With almost 200 key accounts, we strive towards providing prompt and efficient services to our customers. Our clients span across a diverse range of industries; from industrial, commercial complexes such as factories, (medium, heavy to hi-tech industries), shopping complexes, offices, places of assembly to recreation centres, hotels, condominiums and apartments.